Years ago, and I mean years…a visit to CocoCay (when it was properly pronounced Coco”Key”) forecast a relaxing day at a peaceful beach in the Bahamas. The only time you waited in line for anything was if you wanted a volley ball court. For $7, you could rent a floaty mat for the day. Sounds more like Fantasy Island than a Royal Caribbean island. For a mere $200 million, the island is undergoing a total transformation. Now, it’s a Perfect Day at CocoCay and Cay rhymes with Day. Royal Caribbean artist rendering of Perfect Day at CocoCay, including Up, Up and Away helium balloon. Like elsewhere in the world of cruising, everything’s on steroids. Bigger ships, bigger cruise terminals to accommodate bigger ships, and now bigger private beach destinations. Perfect Day at CocoCay is a prime example of bigger must be better. And from the looks of what’s happening there, maybe it’s true. 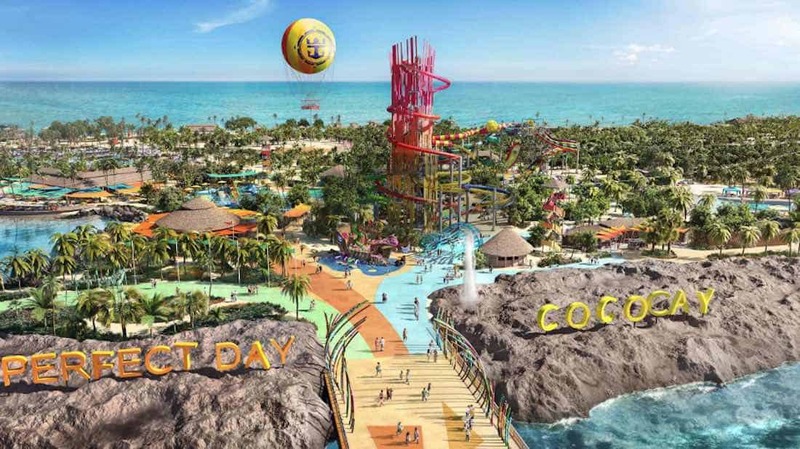 But CocoCay now comes with a hefty price if you want to enjoy all the features and attractions. Where is CocoCay Island located? CocoCay was once named Little Stirrup Cay located in the chain of the Berry Islands. The Berry Island Archipelago is located about 55 miles north of Nassau. CocoCay is close to Norwegian Cruise Lines’ private island, Great Stirrup Cay. What’s Free at Perfect Day at CocoCay? Thankfully, not everything at CocoCay has a price tag. There are still a lot of complimentary experiences to enjoy. What’s billed as the largest freshwater pool in the Caribbean, Oasis Lagoon, doesn’t cost a dime. There’s a kid’s water play area with a pirate shipwreck as the focus called Captain Jack’s Galleon with slides and water cannons. Another no-cost area is Splashaway Bay water park plus sports courts on South Beach. Also at South Beach and Chill Island, you’ll find free beach chairs and beach activities. When your stomach starts to rumble, CocoCay offers five complimentary dining spots throughout the island. These include Skipper’s Grill, Chill Grill and three Snack Shacks. When do all the island attractions open? So far, if all goes according to schedule, May 2019 will see the official opening of the Thrill Waterpark, Zip Line, Splashaway Bay, Up, Up and Away helium balloon. Also planned to open in May will be Captain Jack’s Galleon, Skipper’s Grill dining, Captain Jack’s dining, Chill Island, Chill Grill dining, and Oasis Lagoon freshwater pool. December 2019 will see the opening of South Beach, Coco Beach Club and the overwater cabanas. Currently, the new pier is open and operating. Royal Caribbean says that they are doing their best to avoid any construction issues to guests while at the island. The floating bar and Serenity beach are open and same for the island lunch BBQ, plus the usual beach amenities. Shore excursions are also available for purchase. To begin, Royal Caribbean’s CocoCay price list to use the water park begins at $39 to $74 per person for a half day. Kids under three years have free admission. If you want to spend the entire day at the water park, the price jumps to $44 to $99 per person. Wristbands will be used for your entry into Thrill Waterpark. Once you have a wristband, you may enter and exit the park as often as you like. Half day admissions will be available only in the afternoon. The admission price to Thrill Water Park gives you access to what’s being billed at the highest water slide in North America, Daredevil’s Peak, at 135-feet. The cost also includes another 12 waterslides, Wave Pool, Adventure Pool, complimentary dining at Snack Shack, beach chairs and towels. New will be overwater cabanas, like they have in oh…Bora Bora for instance. They will rent for $299 to $569 but that will not include access to the exclusive Beach Club or Thrill Water Park. Beach umbrellas, spa services and water sports toys are at an additional cost. Towels and beach loungers are still free. Rendering of Coco Beach Club – yes, there’s a fee for this, too. For shade, there are plenty of options; beach umbrellas, clamshells, and daybeds- all available for a rental charge. Over at the beach, there are cabanas available at Thrill Waterpark, and Oasis Lagoon freshwater pool. The overwater cabana at Coco Beach Club accommodates up to eight guests and comes with attendant service, a private hammock, a minibar, and your own personal slide into the sea. An overwater cabana for eight including full admission to the attractions will run as high as $1,599 during peak season. The price of a Coco Beach Club overwater cabana also includes admission to the beach club with its complimentary restaurant, an exclusive beach, a beach clubhouse and other amenities. If you want to ride the 1,600 zipline or soar 450′ skyward in a tethered helium balloon, it’ll cost you. Here’s the Perfect Day at CocoCay price list for all the attractions and experiences. 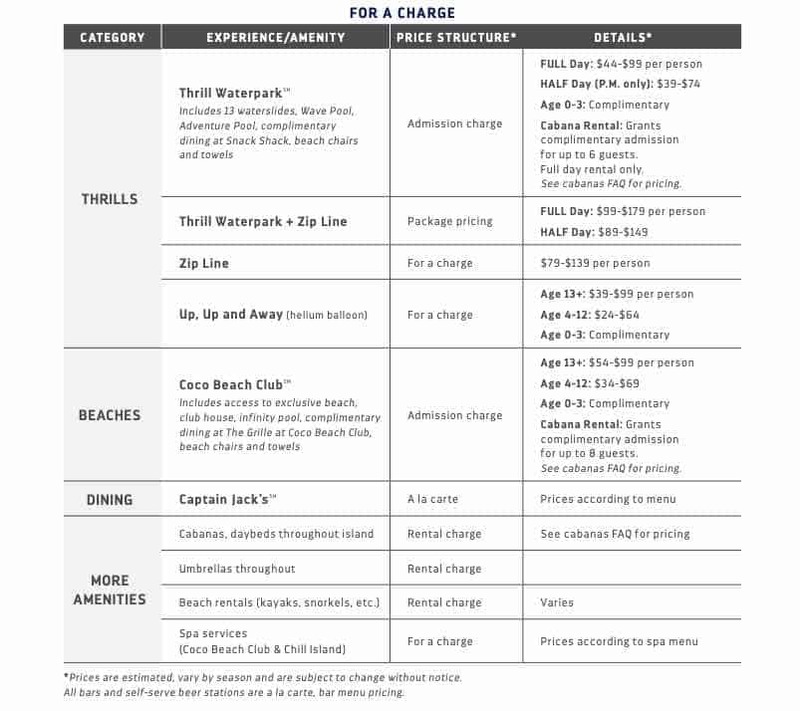 Royal Caribbean’s published CocoCay price list. Shore excursion are offered and additional. All said, it really looks like the quiet day at CocoCay of the past, is gone. For new cruisers or those with families and others just looking for new experiences on an old theme, this is going to be a perfect day.